The resort was featured in the opening credits of both versions of Hawaii Five-0. Get some fresh air and enjoy breathtaking views of Waikiki from your own furnished balcony. Grab sunscreen and shades, the surf is just steps away. Whip up your signature dish or wow your crew with a new recipe. Enjoy the serenity of a private Lagoon Beach, just steps away, or walk 5 min to Kahanamoku Beach for utmost relaxation. Make your next couple's trip unforgettable thanks to Ilikai's modern amenities and a prime locale by the marina. Awarded a 2016 Certificate of Excellence by TripAdvisor, the upscale Ilikai Hotel & Luxury Suites was designed by the legendary architect behind Seattle’s Space Needle. Upon arriving the first thing you’ll notice is the primo oceanfront locale. Next, you may feel some déjà vu. Does the high-rise look oddly familiar? The resort is well-known for being featured in the opening credits of Hawaii Five-0! (Both the 1968 original starring Jack Lord and the 2010 remake). When you enter the stylish lobby, you’ll be greeted by friendly staffers and the aroma of fresh flowers. If you’re weary from your travels (or just feel like some pampering) tell the crew you’ll catch up with them later and treat yourself to a relaxing massage, facial or detox wrap at the Ilikai Massage Spa. Follow up with a refreshing dip in one of the two resort pools, or or just hang out with a cocktail and a magazine. The next morning hit Cinnamon’s to try their award-winning red velvet pancakes with white chocolate topping, or stop by Aroma Cafe for a quick caffeine fix before heading to the beach. On days you’re feeling more active, hit the water! Waikiki is a great spot to try out snorkeling, paddle-boarding or surfing. For an oceanic adventure the whole family can get in on book a sailboat excursion with Holokai Catamaran and watch the kiddos’ eyes go wide when they see their first dolphin or sea turtle. Come dinnertime, no worries if you don’t feel like cooking (you’re on vacation!). The resort’s swanky rooftop restaurant Sarento’s serves up classic Italian fare, super-fresh seafood and unbeatable views of the island. Luxurious studio condos sleep up to 4 guests and two-bedrooms sleep up to 6. Spacious kitchens feature Italian cabinetry – perfect for storing everyone’s favorite snacks – and granite countertops, plus top-of-the-line stainless steel appliances. Head to the onsite Ku'ai Market and grab the necessary ingredients to whip up your crew’s favorite dish. On evenings you feel like staying in, 40-inch cable TVs with Blu-Ray and DVD are perfect for family movie night. Gather everyone on the couch and ask for a show of hands to choose the movie. Or, challenge the kids to a game on the Playstation 3. You can bring your favorite movies and games from home, or take advantage of the onsite rentals. The Tiki Torch lighting ceremony, complete with conch shell blowers and hula dancers, is a can’t miss experience. Watch the sunset and stick around for the local fireworks show put on each Friday. Shopaholics, rejoice! 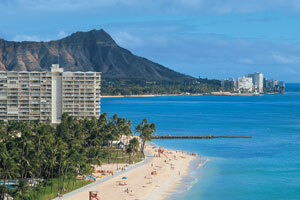 The resort is just a short walk from the Ala Moana Shopping Center, offering a variety of shopping and dining. If you’ve gone through all of the books packed in your suitcase, head to Barnes & Noble to pick up your next beach read. Sweet tooth getting the best of you? Magnolia Bakery’s cupcakes are to die for. Surprise the kids with a visit to Ala Moana Shopping Center’s Family Fun Zone - they’ll have a blast on the Virtual Reality Rollercoaster or the Eurobungy Trampoline. - Rollaway/extra beds are available for USD 45.00 per day.